Just because OneNote Web App is a pared-down version of its desktop counterpart doesn’t mean that you can’t get fancy with it. There is no shortage of creative ways to give your notebooks the wow factor. Although you’re having fun being creative, save some time and get things done faster by using the shortcuts available in the web app. You can use a variety of tags to give your notes another dimension. 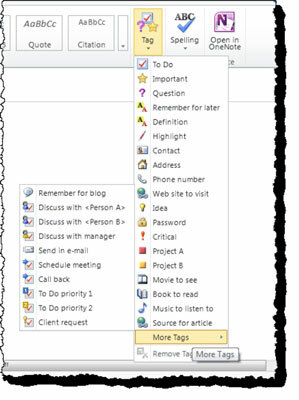 Use the following keyboard shortcut keys to easily assign tags to your notes. Similar to Microsoft Word, OneNote Web App automatically checks your spelling as you type. A wavy red underline displays beneath misspelled words and typical Auto Correct actions are applied, including correcting misspellings and converting characters to symbols. If you click the down arrow below the Spelling icon on the Home tab, you have the option to choose the dictionary for the proofing language by selecting Set Proofing Language. 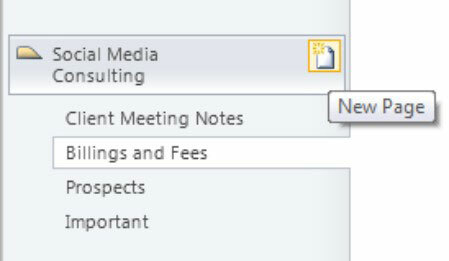 Click the New Page icon in the left navigation pane to the right of the section name. Right-click the section name and select New Page. Go to the Insert tab and then select the New Page icon. The last two options for adding a new page are also the procedure for adding a new section. Right-click a section name to rename or delete the section. Right-clicking a page name brings up a window that allows you to delete the page, promote or demote pages if you have subpages within the section, show versions of the page, and copy a link to the page. Sometimes coauthoring notebooks with other users can create undesirable results. For example, say a co-worker overwrote your carefully worded instructions in your onboarding notebook for new employees. Not to worry. A page version is saved every time someone edits a shared notebook. OneNote Web App allows you to view, restore, or delete previous versions of the page. Go to the View tab and click the Page Versions icon. You see a list of all the page versions listed under the page name on the left pane with a date stamp and the author’s name. Click any of the versions to view it. After you determine the right version to restore, right-click the versions to display the option to hide, restore, or delete it. When you click on a previous version, you see a notification bar at the top of the page indicating that the version is read-only.